Liberia’s IPRI score decreased by -0.27 to 4.619 placing it 15th in the Africa region and 100th in the world. Liberia is classified by the IMF as part of the Sub-Saharan Africa group and by the World Bank as Low income country. Liberia’s Legal and Political Subindex decreased by -0.16 to 3.682 with scores of 3.846 in Judicial Independence, 3.064 in Rule of Law, 4.244 in Political Stability, and 3.573 in Control of Corruption. Liberia’s Physical Property Rights Subindex decreased by -0.47 to 5.548 with scores of 4.613 in perception of Property Rights Protection, 8.501 in Registering Property, and 3.529 in Ease of Access to Loans. 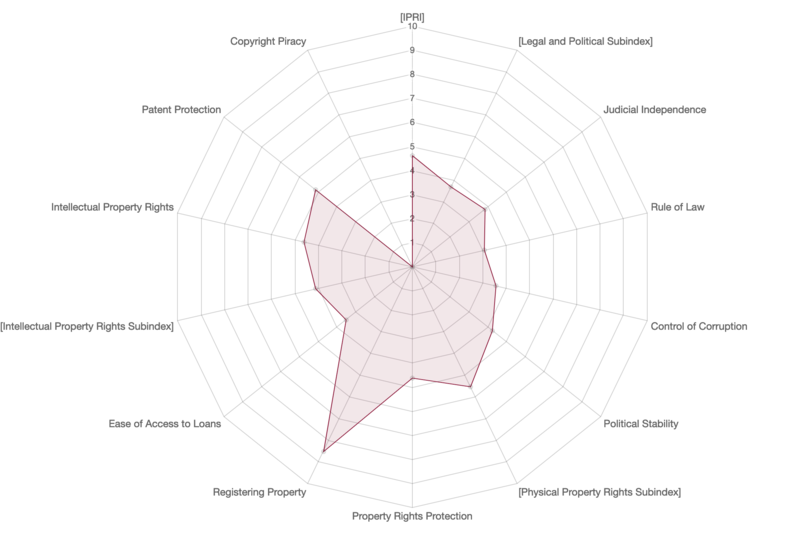 Liberia’s Intellectual Property Rights Subindex decreased by -0.17 to 4.626 with scores of 4.120 in perception of Intellectual Property Protection, 5.133 in Patent Protection, and data wasn't available to measure Copyright Protection.